I am currently laying in a bunk bed at the AT Lodge in Maine. This is real. This is happening. The pilgrimage to Maine included a drive from Georgia to West Virginia, a plane to DC, a plane to Hartford, CT, and a drive from Massachusetts to Maine. Every second was exciting, nerve racking, and stomach churning. I can’t really put into words the way I felt when we crossed the bridge into Maine. Woah. I’m really doing this. I’m really here. In MAINE. I have to acknowledge a few people that helped make the pilgrimage an amazing experience. My grandparents drove me to WV- thank you Pap and Grandma. 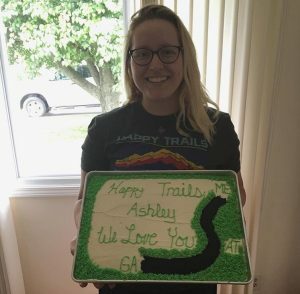 My family in WV threw me a party with an awesome cake- I love and miss you all. My hiking buddy (Jeremy) picked me up from the airport with a can of Pringles (my trail name) and a sign that read, “Hiker Trash”. Jeremy’s mom let me stay the night at her house. And Jeremy’s friend (Katie) drove us to Maine. Incredible people are already a part of this journey. During the drive to Millinocket, ME, we caught a glimpse of Katahdin, the Northern Terminus of the Appalachian Trail. The mountain that I’ve literally dreamed of for over 365 nights. The mountain that gives me chills when I even hear her name. And tomorrow, June 1, 2016, I will climb her and all her glory. I’ll be honest, I’m going to cry standing on top of the highest mountain in Maine. I’ve waited so long for this day. My southbound thru hike begins tomorrow, and I hope you all will follow along for the journey. My life is about to change in every way possible, and I feel as prepared as I can be. After tomorrow, we will head into the 100 Mile Wilderness, and I plan to write again after that. So I will see you guys in 9ish days! Much love and happy trails. PS- I love you, mom. Good luck. I’m excited for all you southbounders! All the best luck to you! I’m planning on a sobo beginning one year from now and am looking forward to your posts. Good Luck, Pringles! We had fun meeting you on the trail in Georgia earlier this month. We will be following your adventure. Mama Bear, Timkerbell, Tree Frog and Super Squirrel. You got this girl. Just finished my sobo in January. I’m rooting for you!!!! Stay STRONG!